Take me out to the ballgame, take me out to the crowd. Buy me some sushi and bourbon cocktails. Nationals Park adds new food options to season's menu. WASHINGTON — Grilled cheese made with fresh lump crab meat and cheddar cheese, sandwiched between two slices of artisan sourdough bread; farm-to-table burgers with meat sourced from the Shenandoah Valley Beef Cooperative; hand-rolled chef specialty sushi rolls; and barrel-aged bourbon cocktails. No, this is not a menu for a new D.C. restaurant. 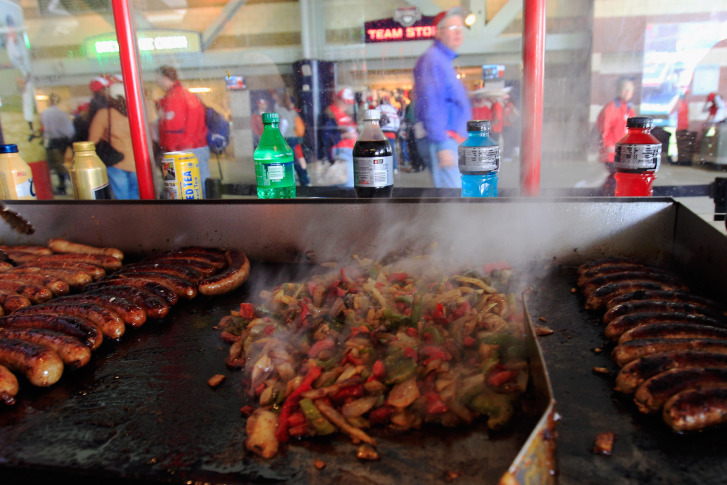 It’s what fans can expect to see from a variety of new concession stands at Nationals Park. This year, the park added a handful of new food and drink items to push its menu beyond typical ballpark fare. This season’s new dishes will be prepared in a new way, too: right in front of customers as they order. Jonathan Stahl, senior director of guest experience and hospitality operations at Nationals Park, says the Park invested a lot of money in this season’s concession equipment so food can be made directly in front of diners. Mike Isabella’s G has been the subject of buzz since the “Top Chef” alum opened the 14th Street sandwich shop last summer. Now he’s expanding his stackable creations to the ballpark with G at Nationals Park. Expect to see Isabella’s classic chicken Parmesan sub, an Italian hero and a meatless roasted cauliflower sandwich. Oh, and one other sandwich: The Drewno, named after The Source’s Executive Chef Scott Drewno. “This is a ballpark hotdog on steroids,” Isabella says. “It’s a sandwich packed full of meat and that’s what we do at G Sandwich,” Isabella says. Lamb chili and peanut brittle will also be sold at the stand in Section 136.